UN City has a facade cladding of white perforated aluminum shutters that act as sunshades. UN City is located on an artificial island, separated from its immediate surroundings, while still being highly visible from both the city and the water. The design of UN City manifests the independent, efficient and professional nature of each UN unit, while at the same time clearly rooted in a mutual set of values. The conference hall inside UN City in Copenhagen has a capacity of 450 people. The sculptural staircase in its core reflects the UN’s work to create global dialogue. The staircase is designed as a dramatic spatial sculpture, which is to be seen as a symbol of the UN's work to create dialogue, interaction and positive encounters between people. UN City, located on an artificial island at Marmormolen (Marble Pier) in Copenhagen, Denmark, is a LEED Platinum-certified green building, which brings together the eight UN organisations based in Denmark under one roof. "UN City was built in two phases, with the first phase finished in December 2012." The initial plans for a UN City in Copenhagen were conceptualised in 2002 and the location at Marmormolen was selected in 2005. UN City was built in two phases, with the first phase finished in December 2012. The building was officially inaugurated in March 2013 and the second phase construction reached completion in January 2014. 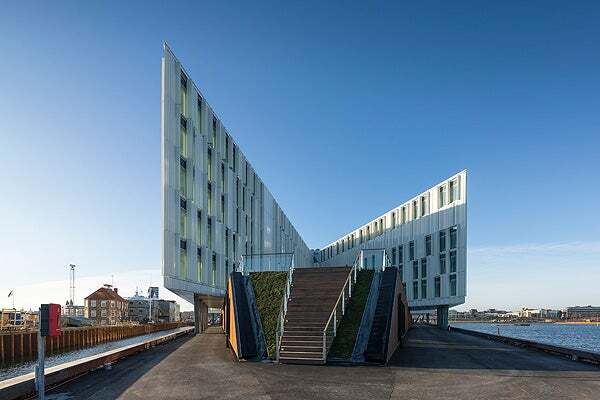 The building was designed by 3XN, while CPH City and Port Development was the project developer. The tender process for the six pre-qualified contractors was finalised in May 2010 with E Pihl & Son declared as the winning company to build the building. The building is owned by Harbour P/S consortium consisting of PensionDanmark and ATP Ejendomme (45.75% each), and By & Havn(8.5%). The construction of the UN City cost €134m ($171m). The building, providing a work space for 1,700 members, was conferred with the EU Commission’s Green Building Award in 2012. UN City merges with the larger development of the Marmorrmolen area comprising a new housing area, a new hotel and commercial buildings, including the LM Project of ATP Ejendomme. The area is being developed by Nordkranen and SNS Property Finance. The star-shaped building includes eight wings and provides a total floor area of 45,000m² (484,376ft²) and 5,000m² (53,820ft²) of technical and storage space. In July 2008, CPH City and Port (a Copenhagen development company) and ATP Ejendomme (a property investment company in Copenhagen) invited six architecture firms to compete in designing the ‘LM Project’. The firms were issued strict instructions to design multiuser office towers of 50,000m² to 60,000m² at the tips of the Langelinie and Marmormolen quays (hence, the name ‘LM’), connecting the buildings with a ‘compelling, imposing and publicly accessible’ pedestrian bridge at least 65m above sea level. The first phase of the project involved the construction of five wings, which cover a floor area of 28,000m² (301,390ft²). The second phase involved the construction of the remaining three wings, covering a floor area of 17,000m2 (182,986ft²). The three wings of the second phase were constructed in an old relief famine depot of UNICEF. The base of the building is assembled with steel from which the white building emanates. An atrium filled with daylight connects the lobby level, where all the common areas are located along with separate offices of the agencies. A central staircase stems from the base of the atrium and connects all the levels together. The facade of the building is made up of white aluminum shutters, which are partitioned into modules, each measuring 3m in length. The perforated aluminum shutters act as sunshades, which can be opened and closed to either trap or reflect the sun’s heat. The building incorporates meeting room facilities and a conference hall that can accommodate up to 450 people. UN City received LEED Platinum certification in January 2014 for its sustainability and energy efficiency, becoming the largest commercial building in Denmark to win such prestigious environmental award. The building meets the Danish Energy Class 1 designation, which requires a building to use less than 50kWh per square metre a year for heating. The layout of all the offices is designed to promote interactions and individual space for work. The building is designed to minimise the use of chemicals and pollutants both during construction and usage. The entire building is fully ventilated with filtered outside air. The building’s roof is coated with a white recyclable layer made from plant-based materials, which reflects sunlight and reduces the solar warming of the building. The roof is also lined with more than 1,400 solar panels with an output of 297,000kWh/year. "The second phase of the construction was completed in January 2014." Pipes are laid on the roof of the building, which is able to capture three million litres of rainwater annually for non-potable use. The building’s cooling system also makes use of seawater, eliminating the use of electricity. The taps throughout the building are fitted with aerators to reduce the usage of water. The building’s technical installations are fully monitored with the help of an integrated building management system (BMS). The main engineer for the project is Orbicon. The contract for interior design works was awarded to PLH/UN Common Services. The aluminium shutters for the building’s facade were provided by Aleris Partner Alumeco. The contract for the landscaping works around the building was awarded to Schonherr.